Unfortunately, some think that it would be a good idea to try and figure out how to make the brain conform to a job or educational system. For example, some say that it would be wise to find a way to get students to conform to regulations and do their work all in the same way. They don’t see the harm to the individual in doing this because it will “help” them do a better job. Many researchers are looking for ways to use QEEG technology to “change” brains so they are not ADHD. Some researchers are also trying to claim that since the brain has proven to have plasticity, my theory that conation is a constant isn’t accurate. Yes. There is a way in which all human beings truly are equal. It is in the quantity of their conative abilities. Yes. There is a part of all human beings that is consistent and sustainable throughout their lives. It is the conative modus operandi. Yes. There is a renewable form of mental energy within all human beings that provides a natural resilience. It is a life-long, replenishable, conative drive. Yes. I have discovered the patterns of a person’s M.O., and try to help individuals and organizations use this powerful resource for productive purposes. Yes. I have found evidence that this resource emanates from a very deep region in the brain. Yes. I can help individuals self-manage this resource to maximize their mental efficiency, reduce functional stress, and bring them the joy of accomplishment. Yes. Ethical leaders have a responsibility to give those they lead the freedom to act, react, and interact according to each person’s M.O. No. I absolutely, positively will not allow my work to be used to justify denying individuals the freedom to act according to their conative strengths. No. I will not sit quietly and watch children and adults be medicated in an attempt to alter or dull their M.O.s – so that they “fit in” or act, react, and interact in a culturally more desirable way. No. I will not assist faulty management systems that try to make human beings “more pliable” or force them to conform to work processes that denigrate their conative strengths. No. I will not go along with brain researchers who, because of ignorance of conation, confuse the neuroplasticity among the three faculties of the brain with the absence of a need to protect the integrity of the brain’s M.O. • Consistency of conative M.O.s assists an individuals’ Sustainability and Resilience and is compatible with theories of neuroplasticity. • It is not only unethical to deny the free use of natural conative abilities, it is also unethical to try to alter the conative functioning of the brain. • It is just plain stupid for any human being to think he or she is smart enough to create a better source of human power than the conative energy with which each person is endowed. I’m not calling the following Pet Peeves, because the term is an oxymoron. A pet is something you enjoy having around, that brings you pleasure and that you pamper. A peeve is something that is annoying or irritating. If Personal Peeves are brought out into the open will they become less irritating? I doubt it. There’s no really good reason for sharing these, but one of my Personal Peeves is my inclination to feel I need to write things that will make a difference in the world. This list is probably not going to make any difference in anyone’s life. It’s way too personal, and it’s not a clearly focused statement about anybody or anything. By my own reckoning, my instincts compel me to be future oriented and to resist living in the past. I’ve thrived by living according to my instincts, even when others have wished I could explain exactly when and where I had done what. It’s not easy to avoid the past. Everyone talks about it – a lot. Most writers start with it. Teachers tell you about it and test to see how much of it you recall. Friendships are built on it. Ideas are refreshed, reinvented, and reproduced? What’s a person to do when redoing and remembering doesn’t come naturally? Look stupid? Seem uncooperative? Satisfy requirements? When I meet others with my conative MO, I often ask them about their survival tricks. They don’t want to talk about what has and hasn’t worked in the past. Worst of all is recalling times they had to justify steps they had previously taken. Having to clean out a storage area in which I’ve dumped 3½ decades of my past efforts has made me realize there are 100s of products, programs and manuscripts that I could retrieve and reinvigorate. I wouldn’t need another new idea as long as I live. I love technology. My Think Pad, iPad and iPhone help me communicate with more people more often from more places. There it was – the paper on which I scribbled a formula, crossed it out and tried again, then again. I could see where my mind had thought to go, then turned in a different direction, then settled on what has worked for decades. None of that process shows up when I work on my computer. I try to do what today’s tech experts recommend and erase most previous versions of docs. What do those show anyway? In the boxes there are pages torn out of yellow pads with squiggles all over them. No stock photos or pics, just my hand-drawn icons for four things I called Powers, Creative Strengths, Positives…finally Action Modes. Version upon version of a concept. My arrows remind me how emphatic I was when I hit on a formula that resonated in my mind. Right there is the one that has been used for decades. I did a swirling circle around it. Lots of swirls. Archiving the details isn’t the point. It’s my process of decision making that matters most – at least to me. Now THAT’S the page where a concept fell into place. 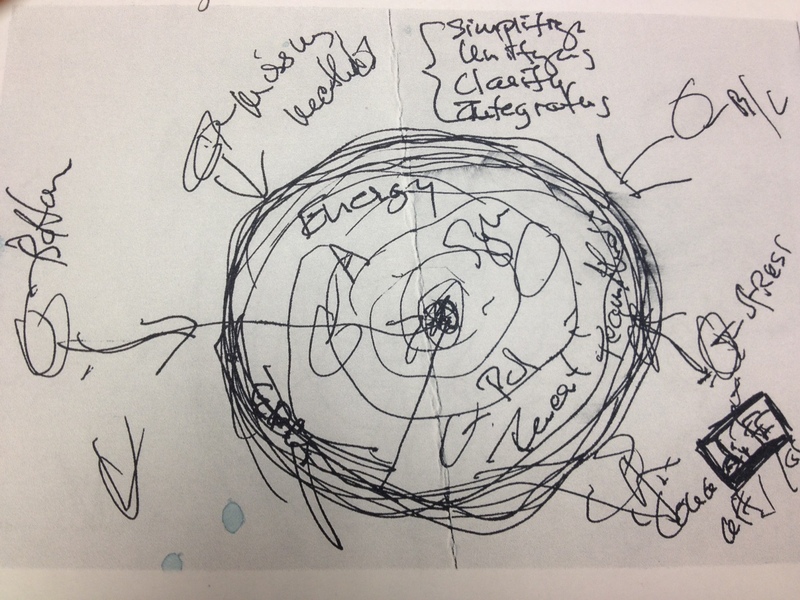 That drawing of the Kolbe Creative Process was in-tune with what felt like truth. Seeing it made me recall putting the pen down, resting my head on the back of the chair as if I were a composer listening to a symphony I’d just completed. Several random yellow (or blue or pink or white) pads later I see the difference. And, I can hear the dissonance I sensed in my head when I moved an element to the wrong place. Computers may screech when they are misused. My mind does that when it senses errors. But it seems louder when I do it with a pen on paper. Another stack of yellow pads. All with lists and lists and lists of words. Days and days, and weeks and months of searching for the right ones. Some pages all nouns. I can tell they were wrong because they were printed more formally. I was certainly being too cognitive. When I see the list of verbs, it’s as if trumpets blared. Yes! I remember my sweeping orchestra conductor movements in the middle of the night. That’s it! It’s all about the harmony of the four types of Action Verbs. Pads and pads and pads of lists. There were the ones from Roget. There were the ones from the physics books. There were the ones from cartoons. There are the lists of names. Hundreds of names – mostly just first names of kids and adults – attached to various sets of words. Yes, I remember Bob defying me to predict what he would do with those tooth picks. There are the names of the gifted junior high kids who found the information fit them to a tee. There is the woman whose name I never got right, but who broke into tears with an MO I will never forget. Some water soaked boxes were carried into the back corner of our undamaged warehouse next door. The IRS would need some of the financial information in the boxes over there. THEY were scanned, but no one rushed to save the boxes of my handwritten work. The results of my thinking have gone into computer programs, formulas, books, and software applications. Thank goodness we’d backed up the damaged servers. There is no way to back up my memory of the process it took to discover conative truths. It’s the conclusions my processes led to that matter to the world. No one but me would be able to interpret these tattered pages. They won’t stop those who believe ideas just pop out of my head. Or that my work must have been stolen from someone with a PhD. As a resistant Fact Finder, I won’t spend much more time looking thru the old stuff. The smudged papers have served their purpose. They told me what I need to do. I need to move forward using all of my techy toys. I also need to protect days for making – and fine tuning – music in my head. I need the process of putting pen to yellow pads. A prolific author I met with today was joyful when I told him there’s a book I’ve written that I’ve never read. He’d felt guilty about the one he’s never read. For me, it’s because the publisher destroyed the creative process and my not wanting to relive the pain.